On March 29th, 2019, New York lawmakers will meet to discuss the regulatory framework that will allow cannabis companies to begin legally selling recreational cannabis. The move will unlock the key to a multibillion-dollar marijuana market, sparking a new wave of fortunes. And the S-50 Trigger algorithm has identified three pot stocks that are positioned to make the biggest, quickest profits. Jeff will tell me exactly what’s happening in all 50 states. And by using the S-50 Trigger, he'll show me how to capitalize on looming legislation for huge gains. I understand that when I claim this report today, I'll have exclusive and unfiltered access to Jeff's private investment group, Green Chip Stocks. I'm ready to join the circle of folks who've been doing this and making millions through it over the past three years. And I want to learn how to profit in a way most people will never get the chance to. 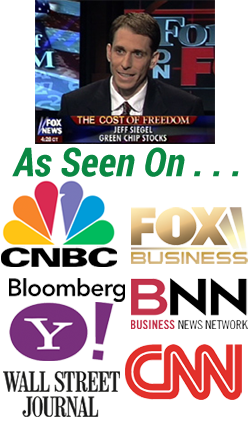 Jeff has appeared on the likes of CNBC, Fox Business, Bloomberg, and CNN. Green Chip Stocks: This is Jeff's personal website where he'll post every urgent update that I'll need to profit from the legal marijuana industry. Weekly Updates: Once a week, Jeff will give me comprehensive updates on the investment opportunities he's already shown me. And this includes the new, little-known opportunities that the S-50 Trigger indicates. Private Deals: I understand that, thanks to his high-profile contact list and boots-on-the-ground investigation, Jeff will provide me with details, when they arise, on how to take part in special private deals from which most investors are excluded. Private Research Trips: As an active member of Green Chip Stocks, I'll be able to join Jeff on private research trips that are only available to his exclusive investment group. I'll also be able to attend private investor dinners that Jeff holds exclusively for his inner circle of like-minded investors. Direct Support: Jeff has explained to me the level of support I'll receive. And that includes support from the handpicked and highly trained tele-team he's put together. All told, I'll be receiving an entire package filled with profit opportunities, including access to Jeff's S-50 Trigger algorithm. And these opportunities could easily make me enough money to retire within five years, buy a vacation home, or take that private Mediterranean cruise. I'd love to join Jeff's inner circle and claim one of the 100 spots he's created — assuming there are still spots left. 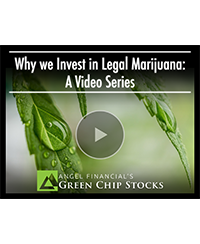 In this bonus video series, I learn why investing in marijuana could not only make me rich but could also serve as a benefit to local economies and even a healthier, more vibrant society. Yes! I'd like to get my copy of “The S-50 Trigger: Your Guide to the Most Explosive Pot Stock Gains of 2019” for the one-time price of $99. This also entitles me to a one-year membership to Green Chip Stocks. ACTIVATE MY MEMBERSHIP RIGHT NOW! I only have to fill out the short acceptance form below, and I'll immediately receive everything I'll need to know to start taking advantage of today's opportunity. I'll also receive everything mentioned above, including my FREE $199 gift — a special bonus video series that explains the basis of Jeff's legal marijuana investment strategy. 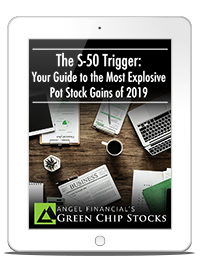 Special Report: "The S-50 Trigger: Your Guide to the Most Explosive Pot Stock Gains of 2019"
When you subscribe to Green Chip Stocks with your credit card, you'll be billed that subscription choice rate. Every 12 months thereafter, we'll automatically bill your card for $99 — the lowest renewal rate that we offer. With this auto-renewal feature, you'll lock in the lowest available price and guarantee that you'll never miss an issue of or recommendation from Green Chip Stocks. This auto-renewal feature doesn't obligate you in any way. You may opt out of it at any time after this purchase.